We got up very late, happy not to have to wake up to sound of the alarm clock at 7 am for another day of riding, and spent the day doing what I had come to Croatia to do – nothing. We took the sleeping mats and our books and headed down to the beach. We were in an area just two kilometers from Omis, with a lot of apartments, and we were a bit afraid that the beach might be too crowded, as beaches are somewhat hard to find in Croatia, most of the coast are just jagged rocks where it is very hard to take a swim, but it was a very nice surprise to find that there was a lot less people than we had feared and the atmosphere was very quiet and relaxed. We laid down our mats and spent the whole day sunbathing, reading and swimming in the crystal clear waters of the Adriatic Sea. In the evening we rode to the center to find a place to have a seafood dinner. 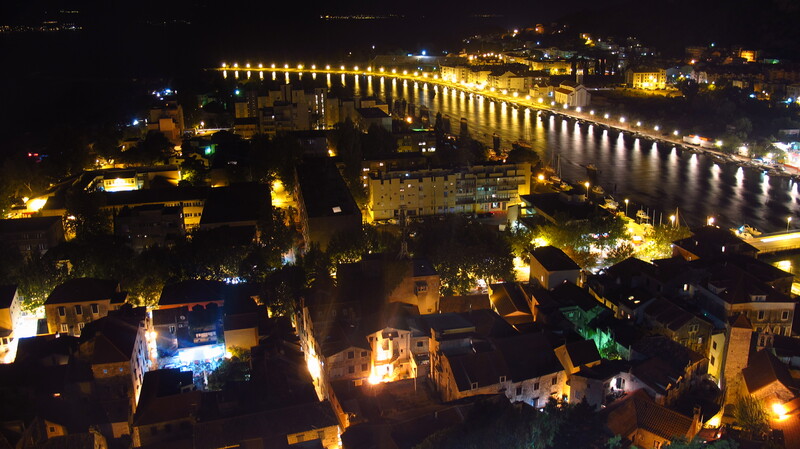 I had spent one of the best holidays of my life in Croatia years back, and one of the things I remembered most fondly was having such a meal in Omis. 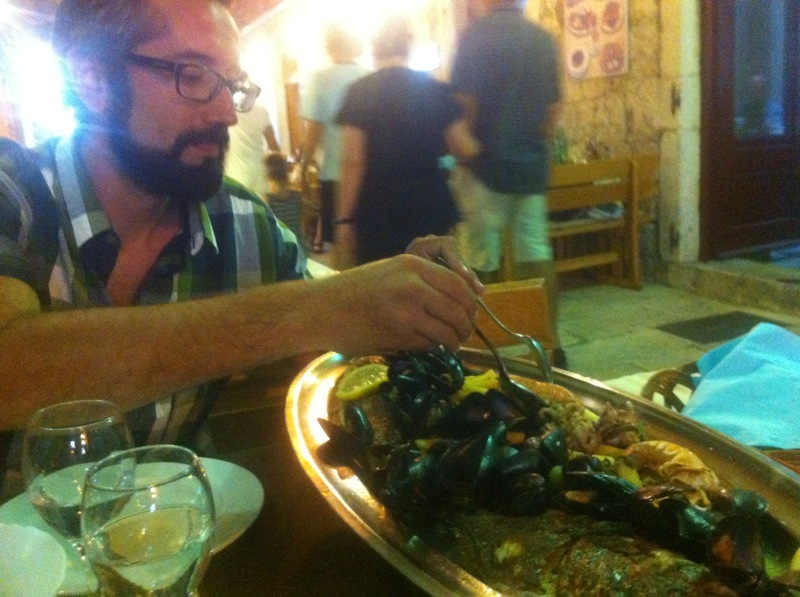 We found a nice restaurant in a narrow street in the old town, and enjoyed a huge platter of fresh seafood and fish. After that we bought a couple of ice creams and then walked up a steep narrow path cut into the rock to the town’s fortress, where a concert was just finishing. It was already dark and there was a beautiful view of the city from the top. Riding back to the apartment, I remembered how, when I was preparing the trip and seeing that I had no budget left for a pair of extra spotlights for the motorbike, I had told myself that I would not ride at night, and here I was, not only riding at night, but riding in shorts, flip-flops, a short-sleeved shirt and a passenger. After so many days of stifling heat and freezing cold in the bulky riding suit, feeling the warm sea breeze on my arms and legs was a wonderful sensation. This entry was posted in Stroming The World 2013, Travel and tagged beach, Omis, seafood, STW 2013 by Kilian. Bookmark the permalink.